It happened to my girl friend's iPhone and it's pretty annoying for the people she is texting with. Imagine that when I text her, my message is received and added on the message thread with her number on and when she replied, i will receive her message but on a seperate thread that has her email address on. So everytime I try to recall what message should i respond, i have to switch to different threads to be sure and have to go back to the thread with her email address on because it is where iMessages are being sent. Otherwise, if i keep sending message using the thread with the phone number, the message is sent as text message and thus i will be charged accordingly. This problem started when Smart (a telecommunication provider in the philippines she is subscribed) had problems with the mobile internet in their area and since her internet connection is down (I'm on Globe Telecoms by the way) our messages became a normal text message. When the connection is restored, all her message started to come from the her email address instead of the phone number. I asked her to to check the Settings > Messages and configure it to send via the registered number but the problem is she is being prevented from removing the email address as the message source. A quick google revealed that there are times when the apple id and the registered number becomes out of sink (probably due to a number of reason which includes internet connection being removed etc). You can fix this problem by turning off iMessage , and then wait for several seconds to minute before turning on the iMessage again. 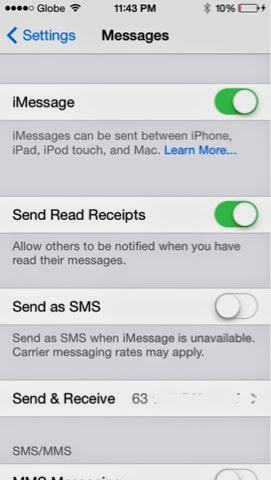 After turning on the iMessage, the service will be activated first before it could work again (this could take up to a minute or two). This is the phase also of the fix where the apple id is being associated with cellphone number.